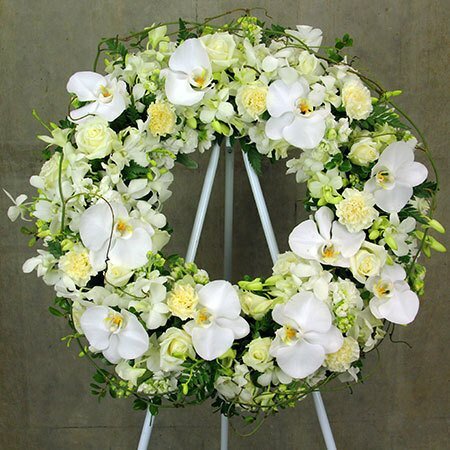 This beautiful floral tribute wreath blossoming with cream and white flowers is the perfect choice for either delivering in sympathy to pay your respects or as a fresh, natural display for a funeral service in memory of the deceased. 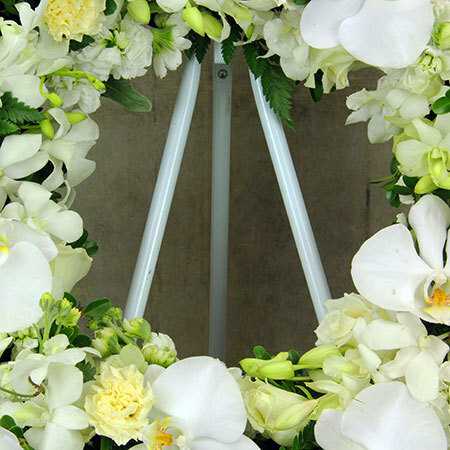 Our florists have designed the wreath using white roses, creamy carnations, fragrant stock, singapore orchids and pure white phalaenopsis orchids for a fresh, classic look. Available in three sizes, this floral sympathy wreath can be ordered via our online florist shop or by calling the team on 1800 66 66 46. 2017-01-29 Prompt specified delivery time. Fresh, beautiful flowers. Exactly as pictured online. Great value. Highly recommended. 2017-01-28 This was the first time I ordered flowers from them. It was for a funeral, and in spite of this being a very difficult time for us, Amanda helped us kindly and promptly with everything we needed. I greatly appreciated their service, especially since I live abroad and needed a trusted vendor to reliably take care of everything and being able to check on the quality and on-time delivery. I would order from them again! 2016-11-16 Service rating : Delivered beautiful flowers to funeral service at very short notice. The customer service was outstanding. 2016-11-16 The flowers were exactly as on the internet. Unfortunately the white ladie funeral people. I SPENT $235 and the ladies pushed past the mourners with the flowers . Breaking bits on the way. 2016-10-02 Service rating : Very helpful and friendly customer service. Product : Flowers are very fresh and delivered on time. The wreath was beautiful. 2016-05-21 Service rating : Excellent service. Delivered with lots of time to spare. Always helpful with all the calls and questions. 2016-01-02 Great service, delivered promptly. Thank you. Constructive criticism is that once ordered the message should be tailored for the occasion. I ordered a funeral wreath. The order confirmation email said "you`ll be making someone`s day soon" which was not appropriate. Product : The wreath was also beautiful, the only thing was they were not on time for the funeral.